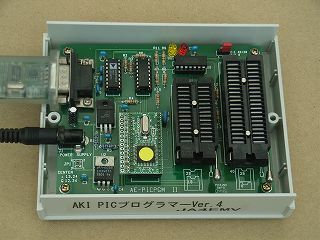 AKI PIC programmer Ver.4 is encased. 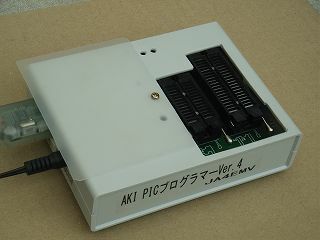 The PIC writer (AKI-PIC programmer Ver4) has become old existence now of which PICkit2 went out. AKI PIC Programmer Ver.4 was encased though it was feeling now said. 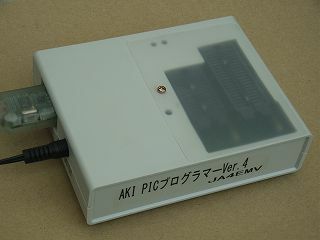 PIC writer AKI PIC programmer Ver.4 is encased. It is the one that PIC writer kit (AKI PIC Programmer Ver.4) was remodeled encasing it that I have used for years. This took the lid on and saw the inside. In the case, it is GB140-35 of [Takachi] and externals size is 140mmX110mmX35mm. It made it to the case with the size of a very limit substrate. Because a part of the substrate hit the place of a right and left installation hole, the substrate was cut a little. The printed wiring board can be installed by using this though seems to be a little different in the installation hole in four corners the size. It floats with the spacer and it installs it. Because the zero insertion force socket (0 Zero Insertion Force socket pressure socket) is not used easily by sinking as it is too much, it puts on IC socket below. It might be impossible to remove the zero insertion force socket from a two sided printed wiring board if there are a very difficult, electric neither solder absorption machine nor experience. You will stop it if not confident. It is a miso your can being allowed hardly to remodel the substrate when putting it in this case. However, it is feeling only as putting in case and puncturing the box, etc. It put it in the case where this photograph is completed. Because Z IF socket part is greatly open, plastic has been covered up. If this cover is rotated, PIC can be inserted in the zero insertion force socket. It is easy to use it very much because the top of the zero insertion force socket is just the same position as the top of the case. I think that dust doesn't enter but externals are good when it is this state. Use might be excellent also in keeping. It uses it with this photograph encased it. The cover above is rotated by 180 degrees and PIC is inserted in the zero insertion force socket. The lever of ZIF might not be operated easily a little. The purpose of this is to confirm the light of LED though a small hole is open in three places on the case. The luminescence such as LED of AE-PGM877 at the time of power supply LED and writing can be confirmed. When PIC of 28P and 40P was used, it was assumed that the case was opened and it did because the chance to use was few though the switch of the jumper pin was necessary. The case is easily opened only by loosening two machine screws. When the combination of versions of the firmware on software on the PC side and the programmer side is different, the writer is not recognized in AKI PIC programmer Ver.4. Software on the PC side is updated and when the version improves, it is necessary to update the version of the firmware on the programmer side. There might be problem in the communications cable as follows when failing in the upgrade of the firmware. The driver of the USB-RS232C converter is renewed in Widows Vista. It is necessary to renew the driver when using it with Widows Vista because PL-2303 is used as for the chip of the USB-RS232C conversion cable of Akizuki-denshi-tsuusyou. I did not work by all means well with Vista, and tried and erred. First of all, it retrieves by "PL-2303" and this driver is downloaded. The device driver is deleted ahead of that or it uninstalls it though it installs after the decompression is done. Otherwise, the communication is not made good though I did both of both. After it does while using PIC programmer Ver.4 by no display while not using it in Vista, the device driver is deleted.